Biofeedback makes unconscious body regulation processes measurable and conscious through feedback to the patient. For example, one can actively influence the pulse, skin conductance, breathing pattern, etc. (further areas of application). The feedback can be conveyed to the patient through sounds or various visualizations in real time. The patient achieves an improvement of the regulation due to this feedback. The positive effect of this learning process, the so-called operant conditioning, has been confirmed by science for decades. Which physical values are measured? If only the electrical brain activity is measured, this is called neurofeedback. 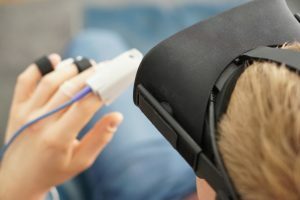 How does a biofeedback session work? The patient sits relaxed in a lounge chair in front of a TV screen. 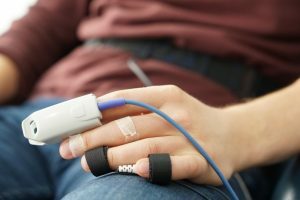 The skin conductance – and thus also indirectly the tension of the autonomous nervous system – is derived via a measuring sensor on the patient’s finger. A hardware/software component analyses this value and displays it on the TV screen in the form of an easily understandable feedback for the patient. At the same time, for example, the muscle tension can be measured via electrodes. The value is displayed as Yes / No feedback on the TV screen. This means that if certain parameters (threshold values set by the therapist) are exceeded or not reached, this state is displayed as positive (e.g. screen becomes bright & sounds audible) or negative (e.g. screen becomes dark & sounds quieter). The patient sits relaxed in a lounge chair in front of a TV screen. 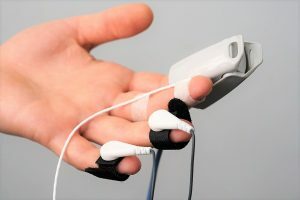 The skin conductance – and thus also indirectly the tension of the autonomous nervous system – is derived via a measuring sensor on the patient’s finger. A hardware/software component analyses this value and displays it on the TV screen in the form of an easily understandable feedback for the patient. At the same time, for example, the muscle tension can be measured via electrodes attached accordingly. This conscious, direct feedback leads to the patient getting to know himself better and understanding over the duration of the therapy how to consciously control his tension and relaxation. Biofeedback is a kind of sharpening of awareness for internal body processes and states. It can easily be combined with other therapy methods, such as neurofeedback, autogenic training, yoga, and much more. The immediate feedback on the success of the technique used increases the motivation to continue and perfect what has already been started.